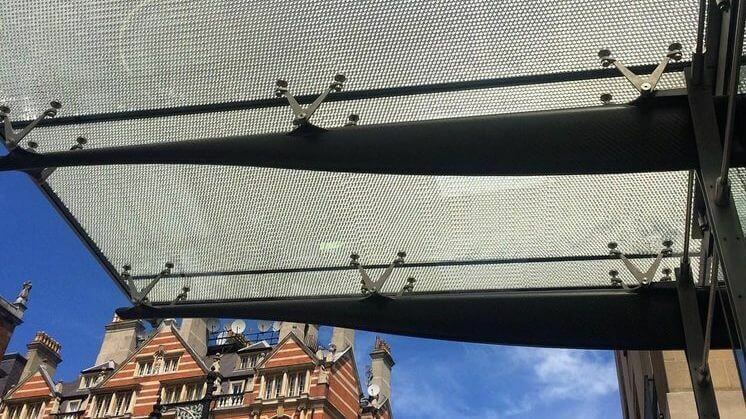 Corex Honeycomb has been involved in the manufacture of The Berkeley hotel canopy. The Berkeley Hotel, in fashionable Knightsbridge, is one of the leading 5-star hotels in London, offering a luxurious stay from a minimum of £420 per night. The luxury hotel suites fuse comfort, style and the latest innovations in contemporary design. A passion for creativity and a long collaboration with the very best interior designers and architects such as David Collins and Robert Angell puts the Berkeley at the forefront of design. The challenge was to design a new breath-taking entrance for The Berkeley, creating a unique arrival befitting to the luxurious hotel. It was important that this new contemporary entrance blended well with the existing architecture. The Berkeley Hotel canopy at the entrance features our aluminium honeycomb core sandwiched between glass and supported by a series of steel columns. Bellapart manufactured the panels, working with architects from Rogers Stirk Harbour + Partners, one of the world’s leading architectural firms, well known for designing No3 World Trade Center. Ivan Harbour, a Partner at the firm said ‘Rather than follow the lightweight, ‘high tech’ add on entrance canopy cliché that has pervaded our cities since Lloyds of London, at The Berkeley we conceived the entrance as a complete new building; a contemporary lean to. The architectural approach, in keeping with the morphology of the hotel was to contrast the new additions, which pioneer glazing and carbon fibre technology, with the existing architecture’. The contemporary façade has created an open, welcoming point of arrival that beams a large amount of natural light into the entrance of the hotel. The hotel are delighted with the final result with the general manager of the hotel commenting that ‘Rogers Stirk Harbour + Partners’ breath-taking new design of our entrance is a perfect example of how an established building in the centre of a major capital can embrace the most cutting edge design aesthetic and provide guests with an exciting environment where they receive an unparalleled sense of arrival.